An event – information about a class or open meeting. 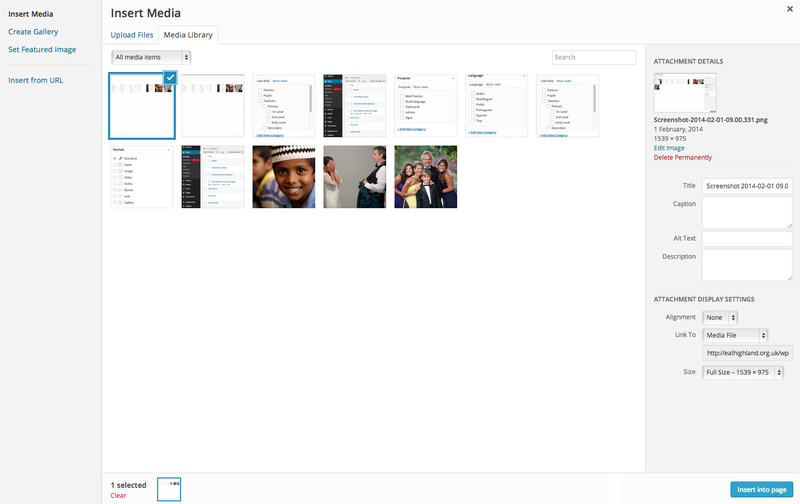 Log in to your WordPress Administration Panel (Dashboard). Click here to do that, if you’re not already logged in. Enter your post title in the upper field – a perfect blend of descriptiveness and brevity (if in doubt, err on the side of descriptiveness). 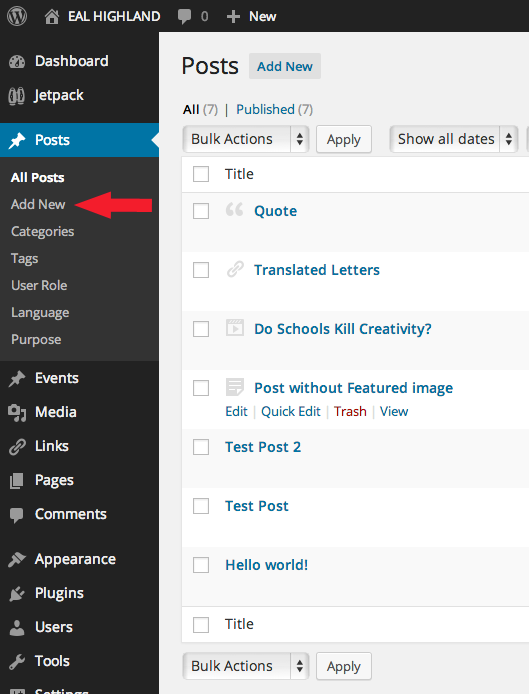 Enter your main content in the larger post editing box below the title field. When ready, click Publish (or schedule to publish later). Left side of Admin Panel with arrow pointing to Add New post. There will potentially be a lot of resources on the site (based on the amount at other prominent EAL websites). For a good user experience it’s really important you take a few seconds to thoughtfully categorise whatever it is you’re posting. Format. In general just leave this set to the Standard format. User Role. Who is this resource or article for? If they’re not there you can add categories, but make sure you apply appropriate “parent” category to keep things organised (e.g. a Home Economics secondary teacher needs ‘Secondary’ as parent). Language. Self-explanatory. Again, just add languages as required. Purpose. What’s this resource for? If it has an obvious, definable purpose that isn’t already there, go ahead and add that to the existing categories. In the long run this will help differentiate the types of resources available (but it has potential to get chaotic if too many categories are added). If in doubt, leave blank. Events are likely to be training courses for the most part, so I’ve created a special kind of post that helps you get the key information in there quickly and easily. Instead of clicking “Add New” under post, click Add New under Events and then follow the notes for each field. The top field is for you to describe what the event is about, the rest is for time and location details. On the Admin screen, click TablePress in the left hand menu. Scroll down to Table Manipulation, and click add row. Click the Advanced Editor button, then click the first field in the new row. It will open up the advanced editor. Click Add Media, then Upload files and upload the new Word doc (first make sure the document has the name that you want to appear in that space – e.g. Numbers). Then fill in the other two fields with relevant book and author, and key vocabulary, respectively. Click Save Changes, and the updated table will automatically appear on the Teddy Talk post. Featured posts are the ones that turn up at the top of the Home page along with a picture. They are the first things people see, so they work well for priority posts (like Teddy Talk, or support packs). You should have either three or six featured posts so that they line up neatly along the top. You may notice a big image above the title on some posts. Also on the “featured posts” at the top of the Home page. These are Featured Images. They’re very easy to include, but they must be at least 1038px wide (check by right clicking the image file and selecting Properties, which should tell you the width in pixels). Also, be sure you have permission to use them, either by copyright or written parental permission where children are concerned. A safe bet are Creative Commons images from Flickr, or Royalty Free images from Shutterstock (although there is a small charge for the latter). You can also include illustrations in acceptable formats (.jpg, .gif, .png). Click the “Set Featured Image at the bottom of the right hand sidebar. 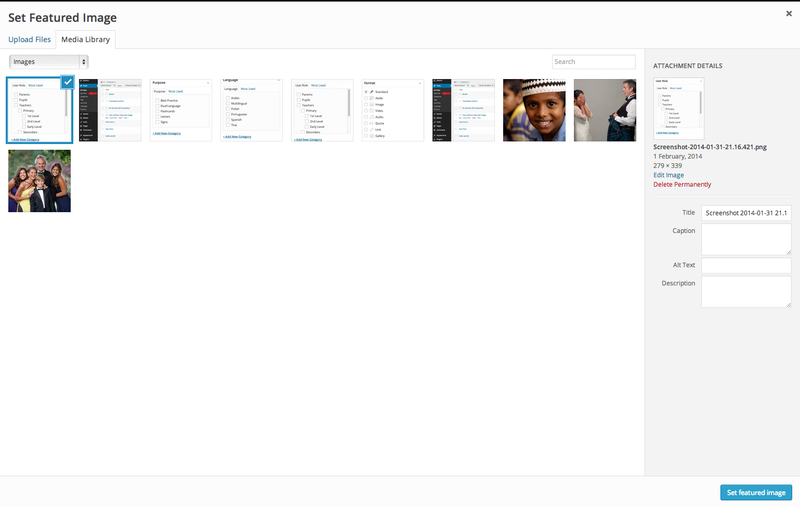 In the resulting window, click the Upload files tab at top left. Click the Select Files button, or simply drag and drop an image onto the open window. (Remember: the file must be at least 1038px wide). The image will then upload to the Media Library and will be automatically checked for inclusion. 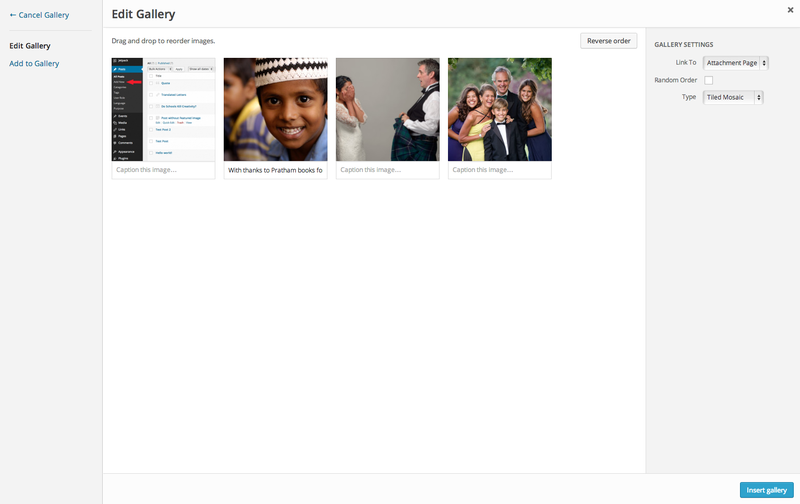 Click the blue “Add Featured Image” button at bottom right to set the Featured image. Done! If you change your mind you can remove it by clicking the Remove features image link at the bottom of the right sidebar and set a new image, or have no image. This is different from Featured Images – these images will appear at the point in the post that you want them to. It’s those options down the right sidebar that matter, particularly Caption and Alt Text. A caption will appear underneath the image on the page describing the scene. Captions are optional. Alt text is for visually impaired people using screen reader software. Public sector websites are legally obliged to provide Alt text. Doesn’t have to be detailed – just enough to say what the image is about. If you complete the Caption field, the Alt field will be automatically filled with the same text. If you don’t complete the caption field then you MUST put something descriptive of the image in the Alt field. Hope that makes sense. The settings on the right should be left as is (Link to Attachment page, and Type: Tiled Mosaic). Then click the blue Insert Gallery button and you’re done. Possibly the simplest of all. Simply cut and paste the URL (website address) of either a YouTube or Vimeo video into the editor on a line of it’s own. At the moment only Vimeo or YouTube videos will work on our website. Must be an .mp3, .m4a, .ogg, or .wav file type. Give the file(s) a descriptive title so we can find them on the server using Search if we need to. Click the blue “Insert into Page” button. Make sure the Text tab, not the Visual tab, is active (at top right of screen). Change back to Visual tab. Now you may need to format the results. If it’s just one document, just put it on a line by itself using the Enter key. If it’s a list of documents, put each on it’s own line, highlight the lot, then click the list icon (same as in Word) in the formatting bar at the top of the Editing window. Make sure your editing screen is set to the Visual tab, not the Text tab. It’s more straightforward. Sub-headings should be Heading 5, and so on. If it’s a long article, use the “More” link button (see examples of “Find out more…” on the home page): put the cursor where you want the Find out more link to go, then hit the More icon on the top row (two horizontal lines with an ellipsis between them, two from right on top row). If you’re posting a quote, highlight all then use the Blockquote icon (the inverted speech marks on the top line). Most of the other formatting icons should be familiar to you if you use Word or similar programs. Another handy tip: if you want to cut and paste from a Word document, try using the Paste from Word option – the W in a box in the middle of the centre line. But it’s still better to type straight into the editor if you can.